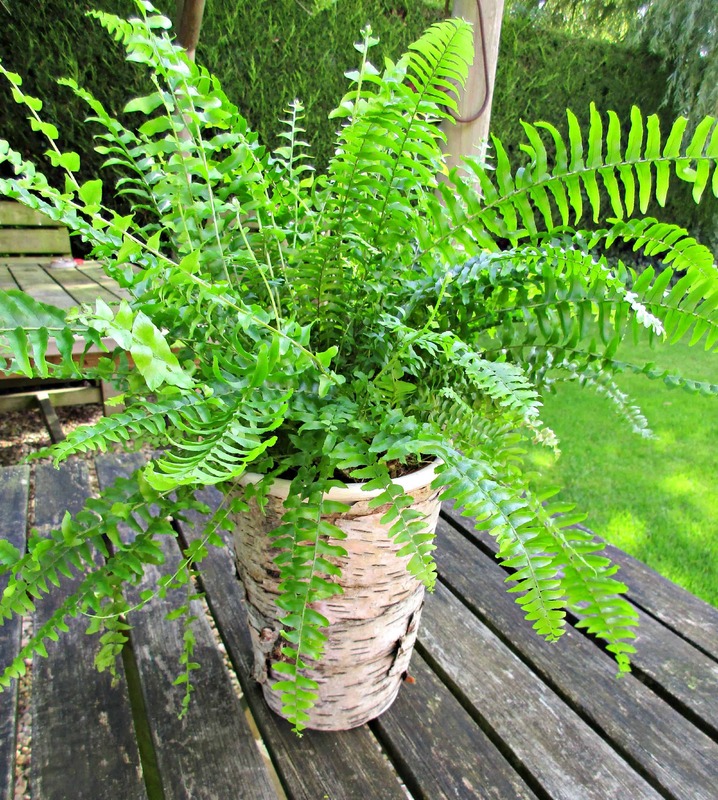 I love rustic home décor elements and have wanted a Birch bark covered flowerpot for ages. But when I first tried pot decoration with bark I could not get it to work the way I wanted. I spent a couple of very frustrating hours trying to stick wet springy bark to pots, using a variety of glues with no success. It was hubby who suggested ‘why don’t you just mold the bark around the pot, and leave it to dry in that shape before you try and stick it’. I think I probably looked like a goldfish for a moment while I digested his comment. It is, in fact, really obvious once someone points it out. 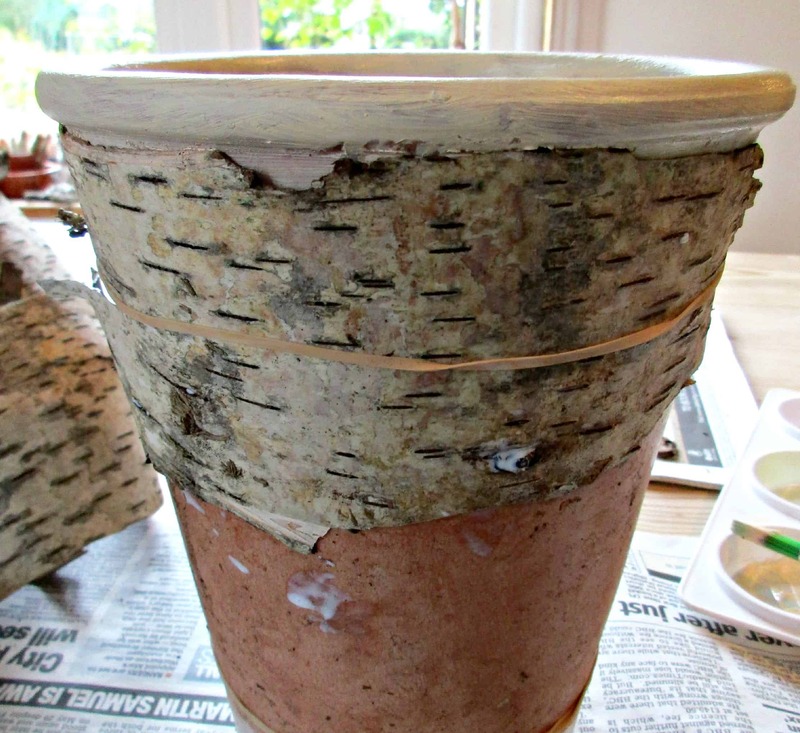 This method for decorating flowerpots in bark works like a dream. 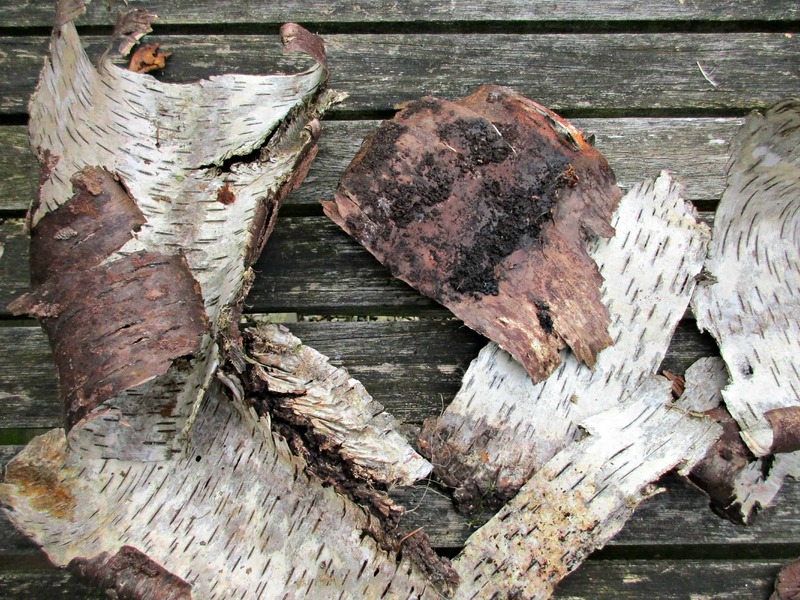 There are a few fallen Birch in the woods where we walk our dog, so I had been thinking using birch bark in crafts for a while. With my new found knowledge of working with Birch bark I would suggest that if you do pick some up, that you immediately roll it with the outer face of the bark on the outside and secure it. Bark will naturally curl the other way if left to its own devices as it dries, making it much harder to work with. 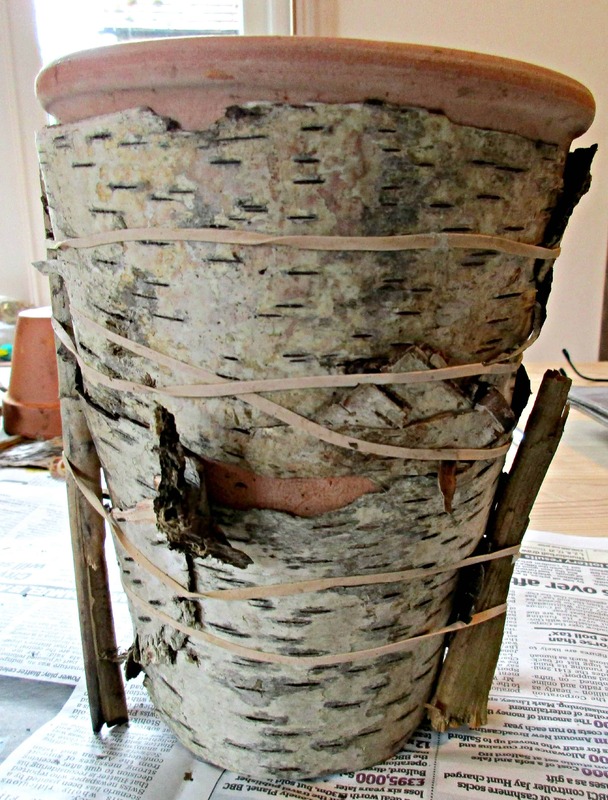 What you will need to decorate flower pots in Birch bark. We also painted the rim of our pot with a cream acrylic paint. 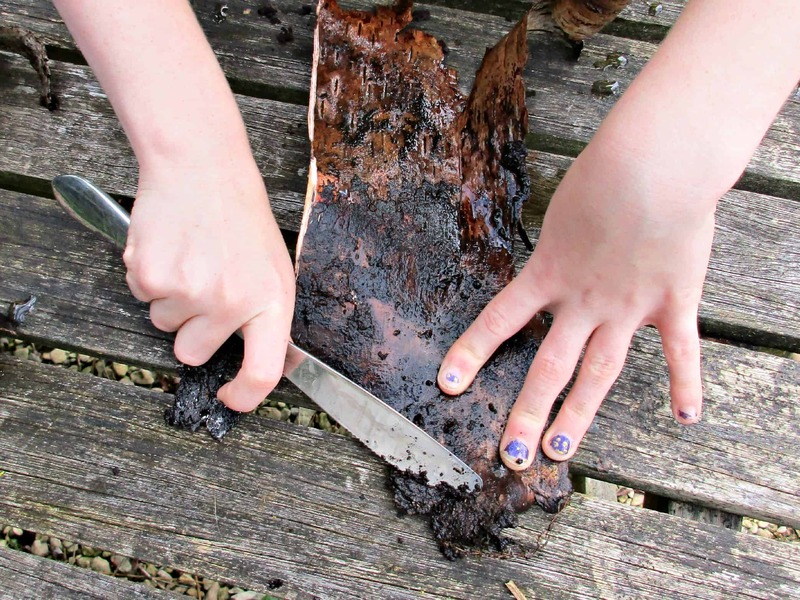 Our birch bark had dried out by the time we came to use it so we soaked it in water for half an hour. Begin by scraping off any lumps on the inside of the bark. Then wrap the bark around the pot, roughly trimming away any excess and leave to dry for 24hrs. We used sticks to stop the elastic bands from damaging the edges of the bark as it has a tendency to split along them. Once the bark pieces has dried into the shape of the pot, remove them. 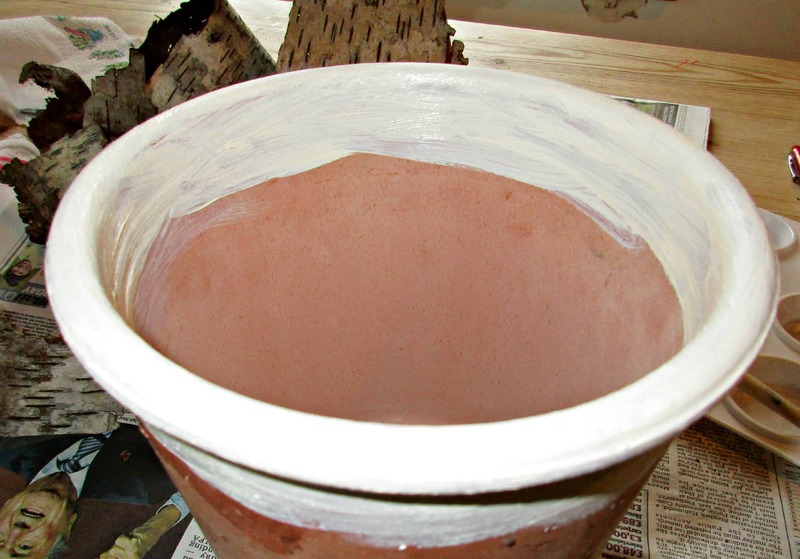 Prime the pot with a watered down coat of PVA glue and leave it to dry. We painted the rim and the base of our pot in cream. This will help disguise any uneven edges of bark once the pot is finished. I would advise allowing the paint to dry properly. I didn’t, and ended up with finger prints on ours! Apply a generous coat of PVA glue to the inside of your bark, and wrap it around your pot. Use the elastic bands to keep it in place as you go. We left our pot for a full 24hrs to dry once the birch bark was glued into place, and it is held on really securely. I am absolutely delighted with how our bark covered pot turned out. It has a wonderful rustic home décor feel to it. Now that I’ve found a method that works I have all sorts of objects ear-marked for the rustic bark treatment. If anyone else has come up with other methods of working with bark I’d love to hear about them. Please do leave any tips in the comments below. 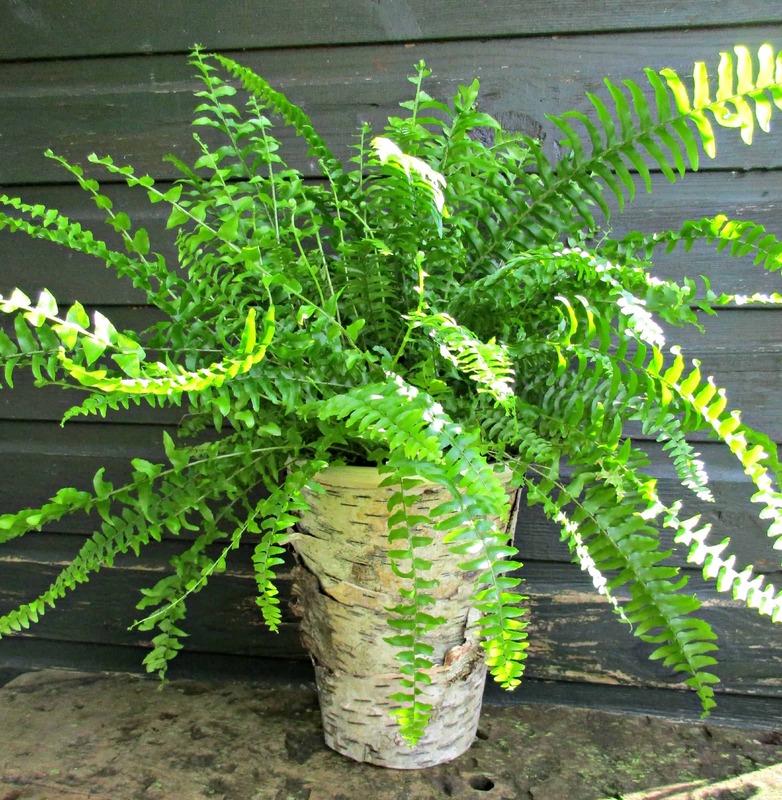 We’ve got lots more ideas for decorating flowerpots on our blog. We particularly love our pretty Fabric Covered Flowerpots and our tutorial for Decorating Pots with Preserved Moss. And for more rustic home décor crafts, why not check out our Living Garden Sculpture and our Twig Chandelier. I found your blog today and it is very interesting. I will come back often for find new ideas. I am from Québec. I have been looking for some direction on this. Thank your hubby for me! Such a simple and stunning idea, I hope this works as well on those ugly plastic nursery pots. 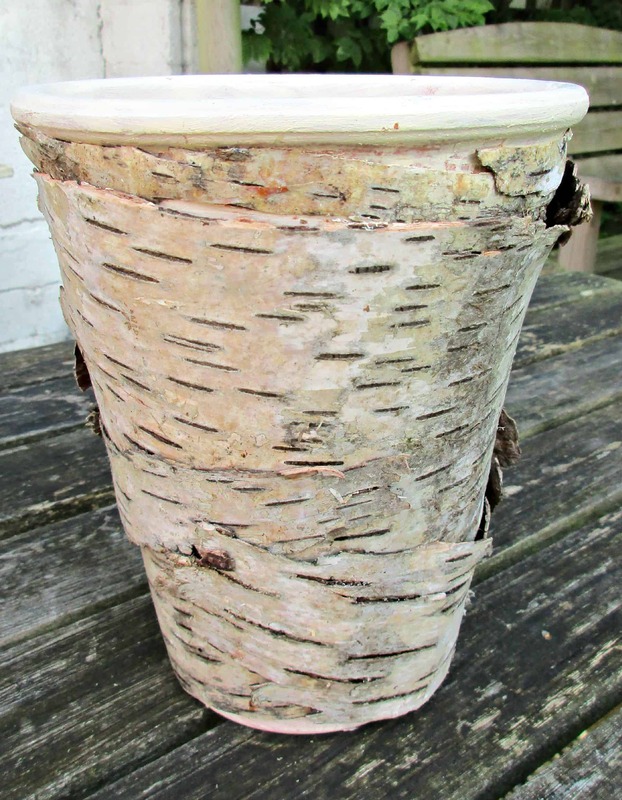 I have a Birch Bark ‘vase’ that I made from one piece of birch bark that I picked up on a walk…….I scrape-cleaned the inside of it and it fit perfectly over a large size coffee can! It has fungi still on it. I keep a slender glass for fresh flowers in it and around them I keep rocks so that it won’t be top heavy. It’s a beautiful seasonal vase. Daisies in the summer and bullrushes and leaves in the fall….either silk for fresh it’s beautiful. …infront of a mirror , it’s twice as gorgeous! Love these! A similar project is a round glass vase with the bark tied around it with silver wire. Then add water and a floating candle inside! Pretty! Thanks Kelly, I still love it although I have managed to kill the plant! I am always surprised by the minds of others, and how creative they are. You surprised me, big time. The pot looks just like a birch tree with the bark peeling of the real tree, just a bit here and there, love your creativity and I would love to have a pot like this! Pinning! Thanks so much for the lovely comment 🙂 and thanks for pinning! Such a lovely effect here Sarah, your response to your husband made me smile, I would be the same but things are always obvious once you know! The natural rustic finish is inspired and a great upcycling idea. This is a fantastic idea! I love how it’s turned out, a great country feel, I should do this to some of the pots in the house. I didn’t realise that bark sticks so well, must think up some other ideas to use this for too, it would be great for some unique art work. You have some fab ideas! What a great idea – love the rustic look. Many thanks for sharing this fabulous technique!